When you think about the major players in the golf equipment market, there are probably four names that come to mind right away – TaylorMade, Callaway, Titleist, and Ping. While those are all big players in the market, Adams is another brand that should not be forgotten. They have been producing quality equipment for many years, and one of their latest offerings is the Men’s Tight Lies Hybrid. The Tight Lies line of clubs is probably the most recognizable in the history of the Adams golf brand. The Tight Lies fairway woods have long been popular among golfers of all skill levels for their easy-to-hit design and clean looks. With this new hybrid, many of those same features and benefits are now available in a club that can bridge the gap between your other fairway woods and your long irons. Hybrids have become popular because they can replace harder to hit long irons, and that is exactly what this club is designed to do. 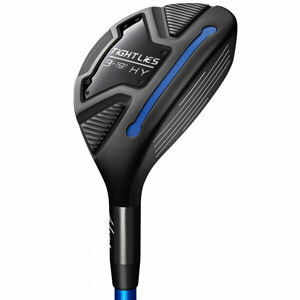 To make sure that you are able to find a Tight Lies Hybrid that perfectly fits within your set, this club is available in five different lofts. The options include 17*, 19*, 22*, 25*, and 28*. When assembling your set and picking out the perfect hybrid to add to your bag, you want to think specifically about carry distance. How far can you hit your longest iron? How far can you hit your shortest fairway wood? The hybrid that you purchase should slide nicely between the yardages for those two clubs. Additionally, the Tight Lies Hybrid is offered in right and left-handed models, as well as four different shaft flexes. Adams has always been one of the leaders when it comes to putting new technology into their clubs, and that tradition continues with the Tight Lies Hybrid. The ‘Ghost Slot Technology’ used in this club hides the crown slot while still offering added forgiveness over a hybrid club with a traditional design. With a slot on the crown and the sole of the club, the face of the hybrid is able to deliver higher ball speeds from a wider-range of locations across the face. That means that even when you don’t quite hit the ball on the sweet spot, you can still enjoy plenty of distance on your shots. If you haven’t yet added a hybrid club to your bag, now is the time to try one for yourself. Too many golfers struggle with hitting a three or four iron for no reason when easy-to-hit hybrid clubs are readily available. Check out the Adams Men’s Tight Lies Hybrid and you just might wave goodbye to your long irons forever. The Under Armour brand is one that has been growing in the golf world in recent years, but one single decision that they made may have set the course for even bigger growth in years to come – the signing of Jordan Spieth. The newly-crowned Masters champion would appear to be the new face of American golf, and Under Armour has him under contract for years to come. Of course, having all of the exposure in the world won’t do any good if the products that they are selling are low quality or undesirable. However, that isn’t the case. 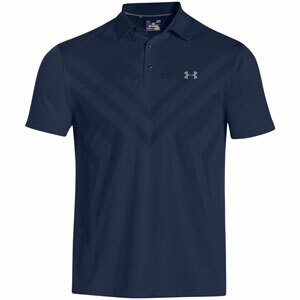 The Under Armour Men’s Armourvent Tips Polo is a great example of the stylish golf gear that UA has made available on the market. This shirt manages to bring together the modern styling of the Under Armour brand while remaining traditional enough to appeal to a wide range of golfers. The shirt is available in a number of different colors and includes a subtle design across the chest. Performance is one of the main calling cards of the Under Armour line, and the same can be said about this polo. The Armourvent is designed to keep you cool on those warm days out on the course, so it has mesh ventilation included in specific locations on the shirt. It is a 100% polyester shirt, and has an anti-odor technology included as well. As a golfer, you know just how hot it can get out on the course during a summer round that can take four hours or more to complete. Anything that can help you stay cool and dry should be considered a benefit to your game, and this shirt can help toward both of those goals. While you don’t have to wear the Under Armour logo from head to toe like Jordan Spieth, you still might be interested in exploring some of the other gear that they have produced for golfers. Shoes, pants, hats, and more are all offered by this company which has suddenly burst onto the scene in the golf world. If you find that you like some of the products offered by UA, there is a good chance you will enjoy others in their line. After all, if they are good enough to win the Green Jacket in such impressive fashion, they are likely good enough to help you play your best.